The U.S. State Department has granted a waiver to allow a Yemeni mother to visit her 2-year-old son who is clinging to life at an Oakland hospital, the Council on American-Islamic Relations announced Tuesday. Bob Redell reports. The U.S. State Department has granted a waiver to allow a Yemeni mother to visit her 2-year-old son who is clinging to life at an Oakland hospital, the Council on American-Islamic Relations announced Tuesday. Shaima Swileh was in Egypt as of Tuesday, hoping to get on the earliest flight that will let her visit her son Abdullah at UCSF Benioff Children's Hospital, CNN first reported about the announcement. She is expected to arrive in the Bay Area Wednesday night. 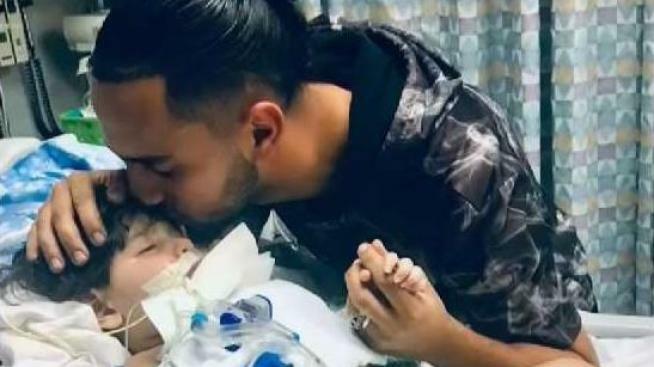 Abdullah's father, Ali Hassan of Stockton, said Swileh has been crying out in happiness to be able to see her son, who has a genetic brain condition that has worsened. "This was the best day ever," Hassan said. "I'm glad that my wife got her visa." Hassan previously broke down in tears at a news conference held Monday in Sacramento as he pleaded with authorities to allow Swileh to travel to the U.S.
"My wife is calling me every day wanting to kiss and hold our son for one last time," Hassan said. "Time is running out, please help us get my family together again." Abdullah turned 2 years old last week. His father brought him to the U.S. earlier this year. Both Abdullah and his father are U.S. citizens. Swileh, however, is a Yemeni national and, before receiving the visa, was unable to visit under President Donald Trump's travel ban, which applies to mostly Muslim majority nations. Doctors had told the family that the boy's body wouldn't withstand life support much longer. "Our hearts are breaking for this family," said Saad Sweilem, a civil rights attorney with the Council on American-Islamic Relations. "The loss of a child is something no parent should experience, but not being able to be there in your child's last moments is unfathomably cruel." The family's plight had drawn support from a wide spectrum of religious leaders and civil rights activists, who hope to put pressure on Congress and the Trump administration. Betty Williams, president of the Sacramento branch of the National Association for the Advancement of Colored People, also called on Trump to allow an exception. "It's criminal that we have to stand before you and beg" for the family to be together, Williams said. An online action alert by CAIR, demanding that the State Department and the U.S. Embassy in Cairo reunite the family, had received more than 6,000 entries of support. "As a mother myself, I am stunned by the cruelty of barring a mother from reuniting with her sick child. The case of Shaima Swileh shows clearly the damage wreaked on families across this country by the Trump administration’s un-American travel ban. I am committed to doing all I can to fight it and to restore decency and humanity to our nation’s immigration laws. I have written to the State Department to urge this administration to grant Swileh’s request for a ban waiver and will work with her family and federal authorities to help reunite her with her son, Abdullah."